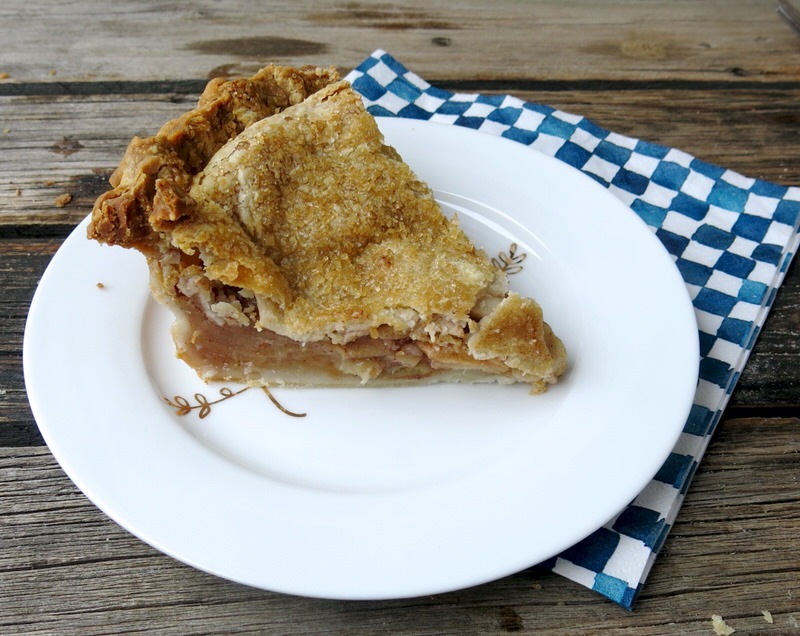 Homemade Apple Pie was my dad’s favourite dessert. 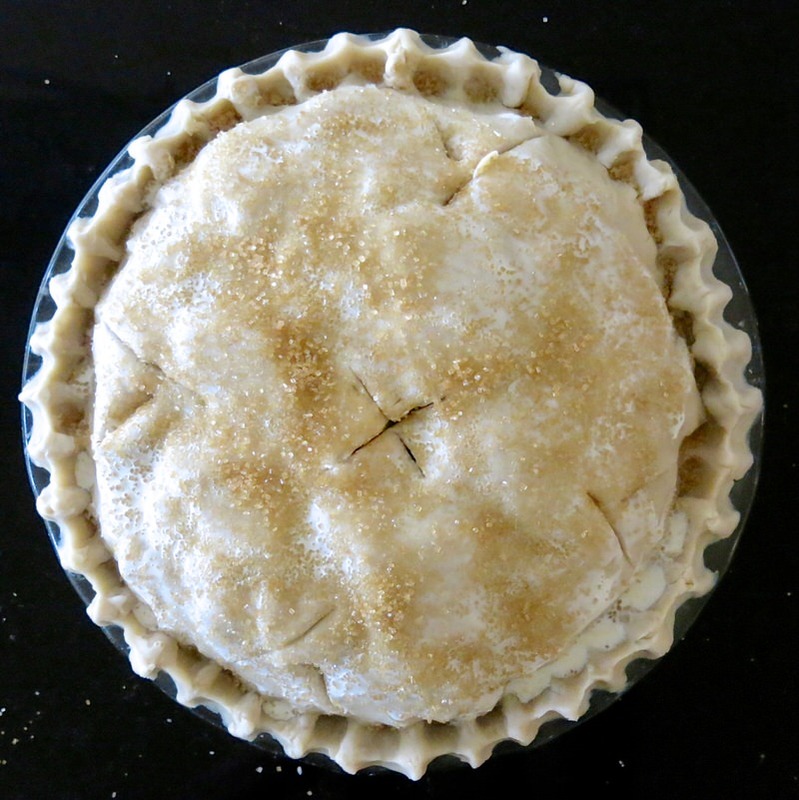 It is impossible to make an apple pie without thinking of my dear dad. He was the ultimate tease and had a great sense of humour. 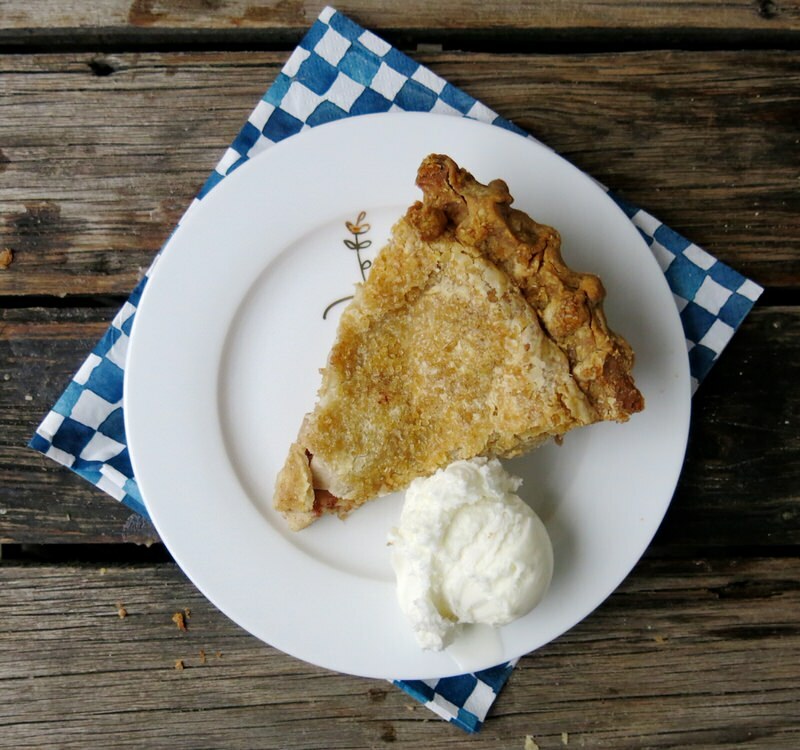 I’d have a friend over for dinner after school and once the table was cleared after dinner, he inevitably asked, “Would you like a big piece of homemade apple pie for dessert?” Who wouldn’t? His answer? “Me, too! Sure wish we had one!” Oh, we would giggle and he would sometimes embarrass me with this kind of teasing, but one time he asked a little friend down the back alley, and when she found out there wasn’t any pie, she started to cry. I felt so bad. Not for her! For him! He would never want to hurt anyone and I decided I didn’t like her too much anyway. 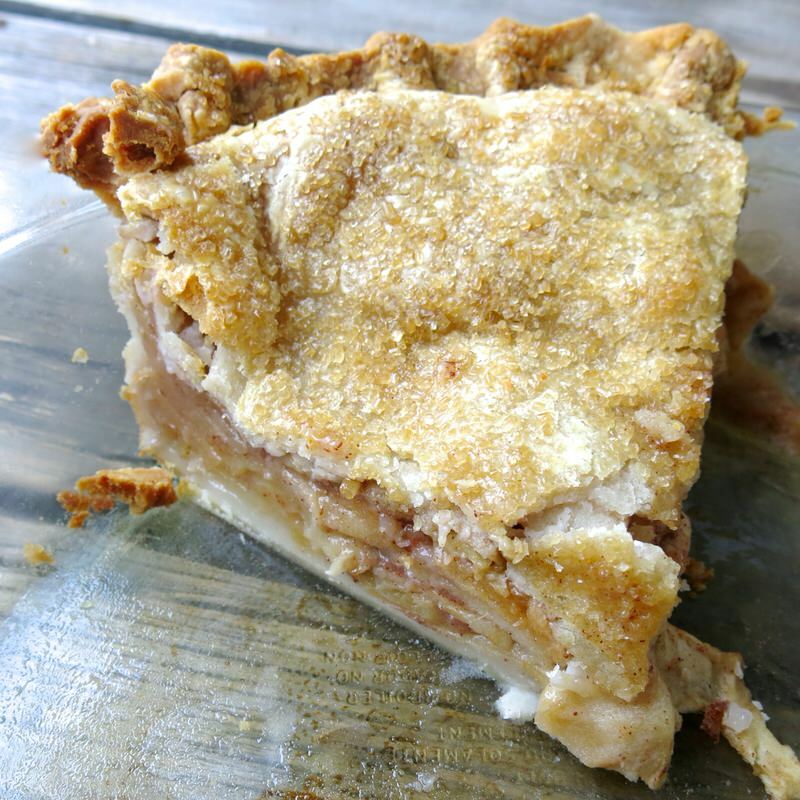 But, we sure loved apple pie at our house. 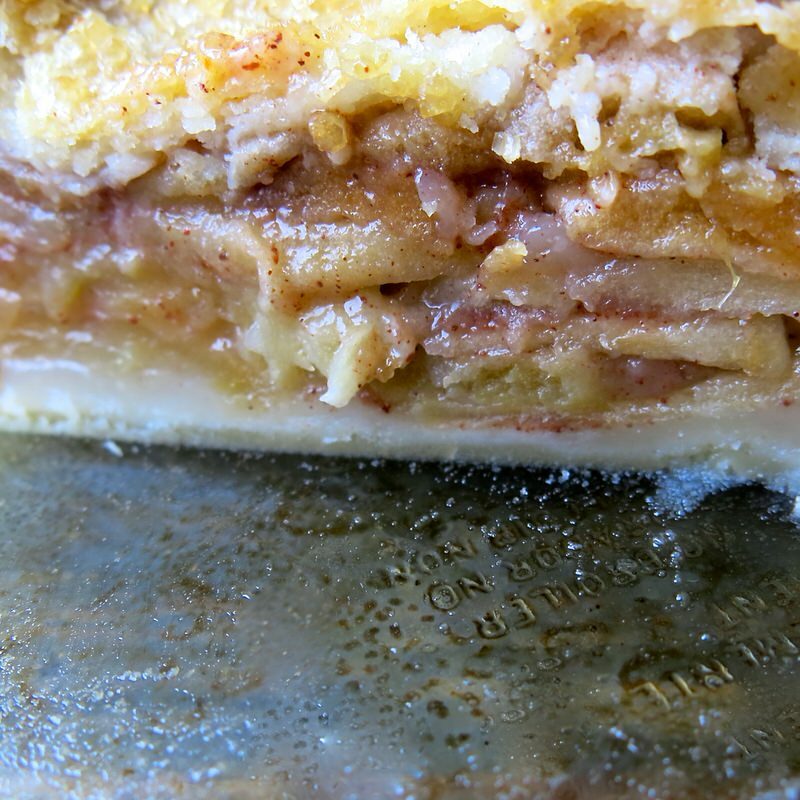 Almost every Sunday mom would make a homemade apple pie. In those days, we ate a piece. Only one. and it was a “regular sized piece” which would be notably small in this day and age. Dad loved his with cheese. 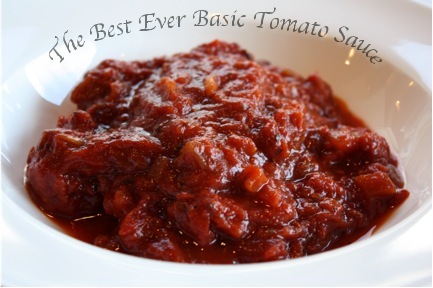 That was a very common accompaniment with a homemade apple pie when I grew up. You could buy a slice at the Kresge’s counter or at The Hudson’s Bay with a slice of Velveeta or cheddar. I did love my apple pie with cheese. It was soooo delicious. We rarely had ice cream, but I loved it with ice cream, too. When we had both, it was tough to choose. We all had one piece on Sunday at dinner and we never saw that pie again. I do believe the other half was in the cupboard and am pretty sure it was finished off by my dad – a little each night – after we went to bed. Vanja loves apple pie, too. His mom’s homemade puff pastry strudel is his favourite, as that is the kind of apple pie he grew up with and he also loves apple crisp. Almost every Sunday, still, my mom brings Vanja a homemade apple pie fresh out of the oven that she has made him for dinner. I make the dinner and she brings dessert. She will be 88 this April. Yes, we are blessed. The Canadian prairies are prolific with apples. We grow them everywhere. All kinds. All shapes. Many varieties, but not the kind we buy in the stores in the winter. 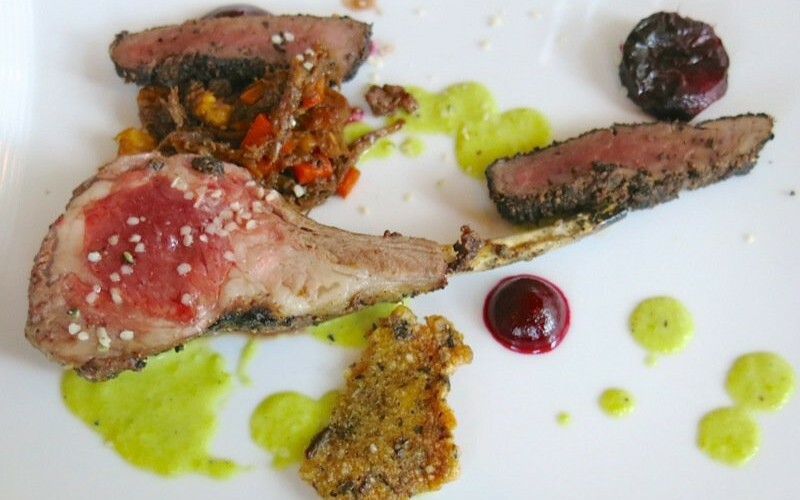 Those are from British Columbia, our next door neighbour, as they are grown in the Okanagan Valley that has been blessed with a micro-climate, not unlike the one in Napa Valley. 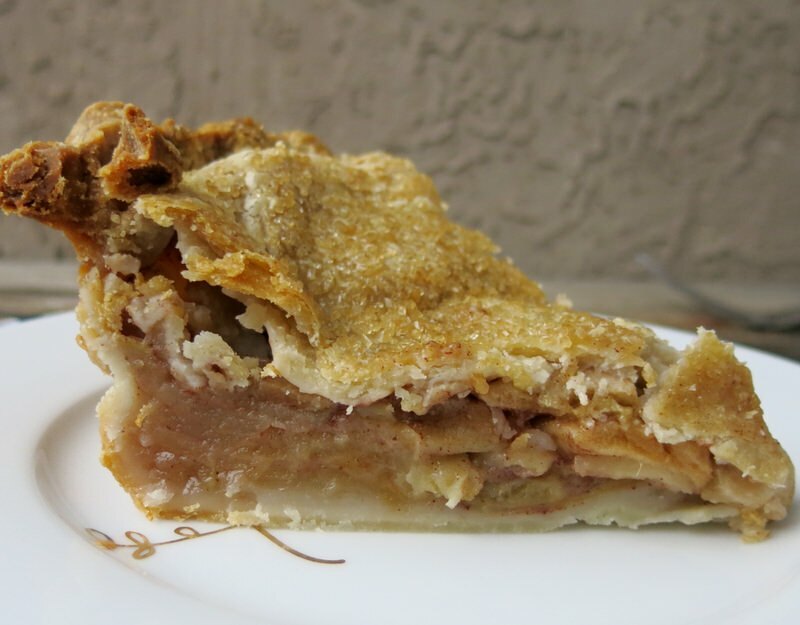 Mom always made her apple pies with McIntosh apples. There were few varieties when I was growing up and the McIntosh was coveted. Every fall, end of September or beginning of October, we would know when the apples were “in” as we would see clowns on all street corners downtown selling them. We’d get so excited. 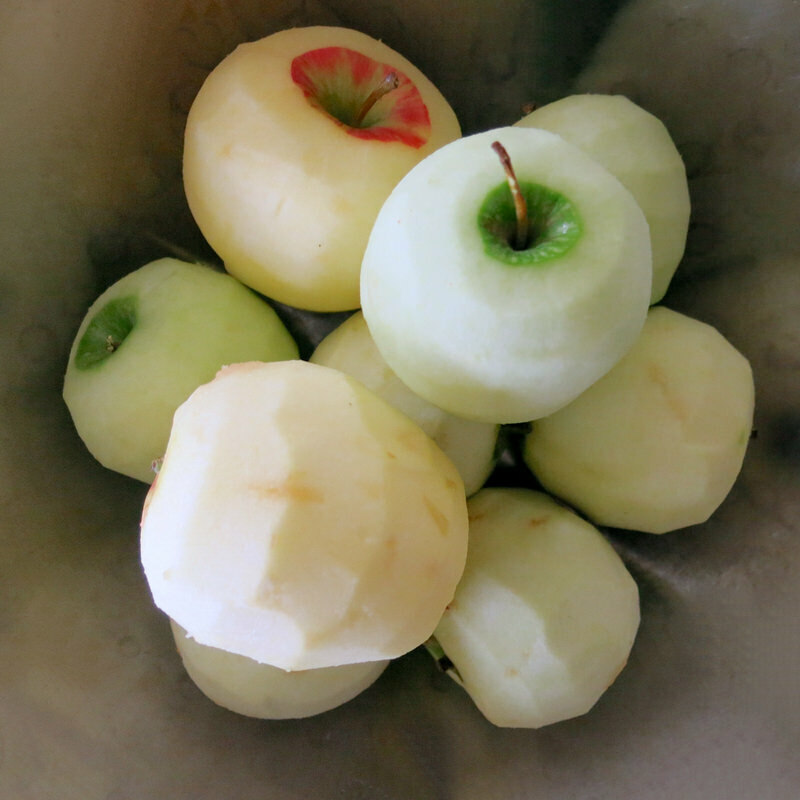 There was nothing – and I mean truly, nothing – like biting into that first McIntosh apple every fall. 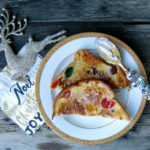 When seasonal food was only available in the season, it was so revered. So cherished. So respected desired and appreciated. It was the Kiwanis Club in Red Deer that worked with BC Tree Fruits or BC Apples back then and brought them into the city as a fundraiser. 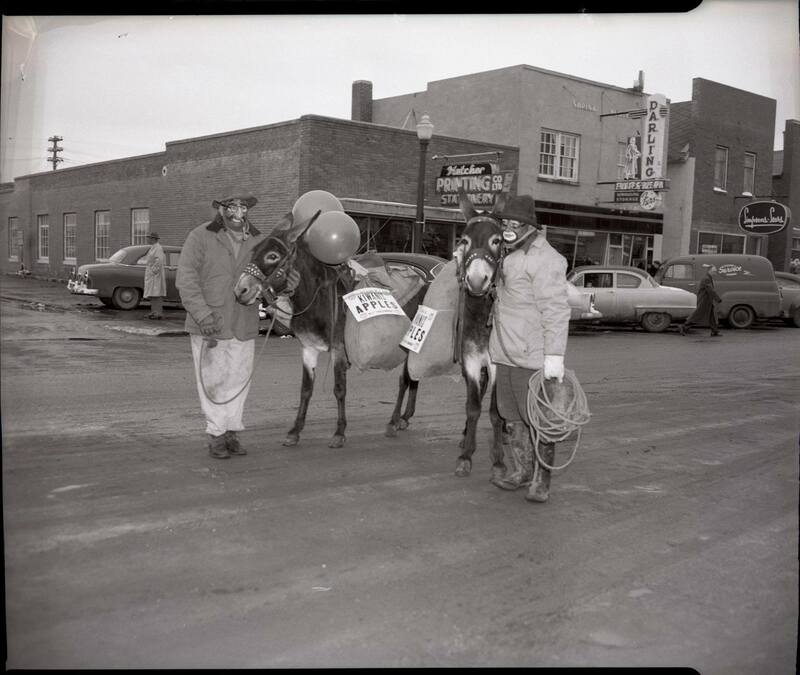 Above, great image of Kiwanis clowns selling apples on Ross Street, 1954 Ross Street (Red Deer Archives N5490) provided to me from Michael Dawe in Red Deer. This was before my time, but a great image of a time that preceded mine that I was completely unaware of. Mules! Amazing! The second image is still before my time, but the clown costume is exactly how I remembered them… odd, floppy and with big numbers. The clowns did have make up, noses and carried oval or oblong BC Apple Wooden baskets with red handles in my day. But, this image is from about 1959 of Jack Shillabeer, apparently known for his pipe, provided to me by his daugher Audrey. 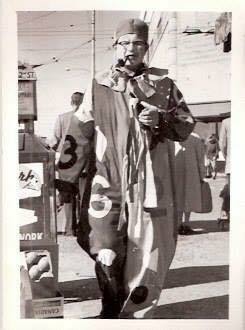 They were in Red Deer from 1953 to 1959. She tells me that to this day her family always has their homemade apple pie with thin slices of Canadian cheddar. Of course, we could buy them in the stores, but usually, a week after the Kiwanis Clowns had them for all. They continue to sell fancy McIntosh apples to this day at Farmer’s Markets in Red Deer to raise money, but sadly, there is no historical archive about their clowns. Did you notice the variety of apples in the bowl? 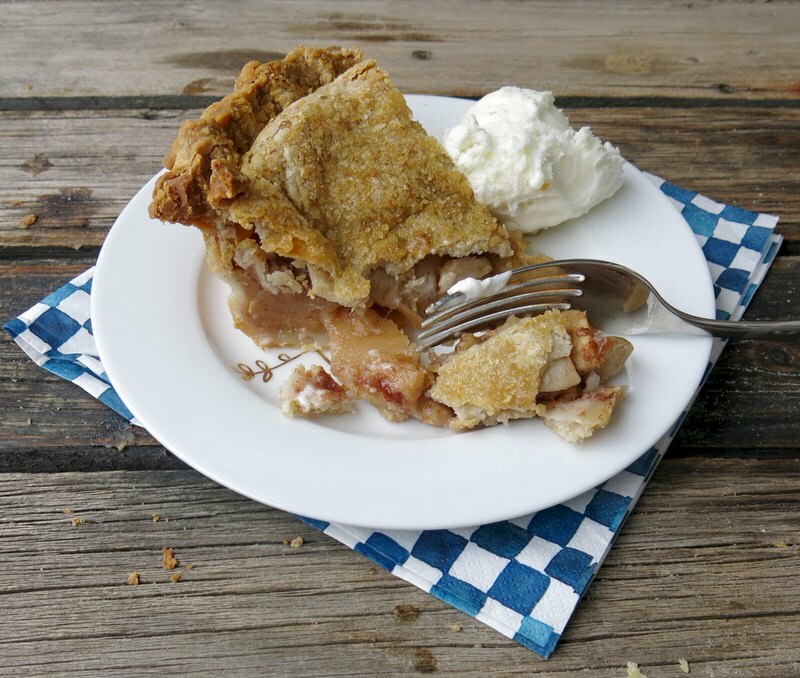 Attending Christmas in November one year, Anna Olsen and her hubby emphasized that the best apple pies were always made with a variety of apples. 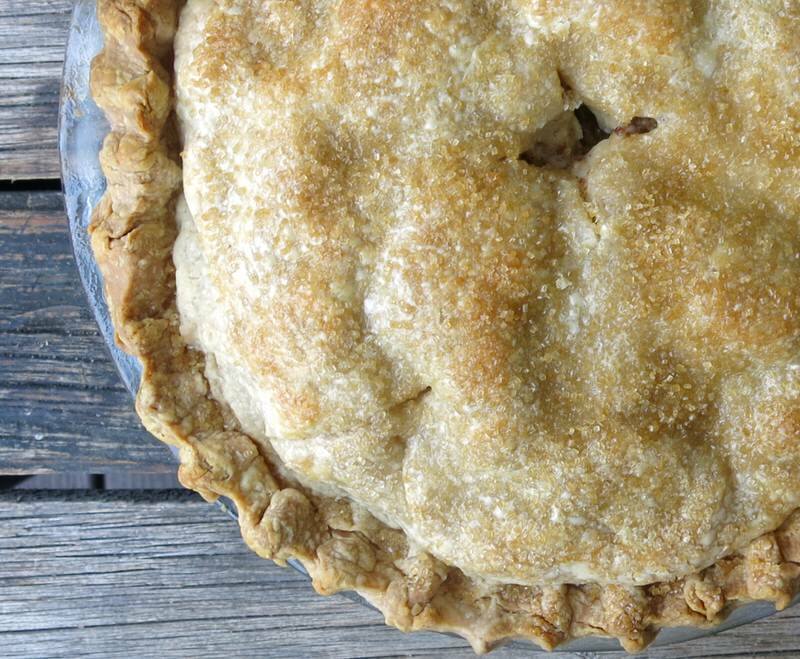 “When you’ve judges more than a few apple pie-making contests, you come to learn that the winners always use a good variety of apples in their pie.” Their advice? 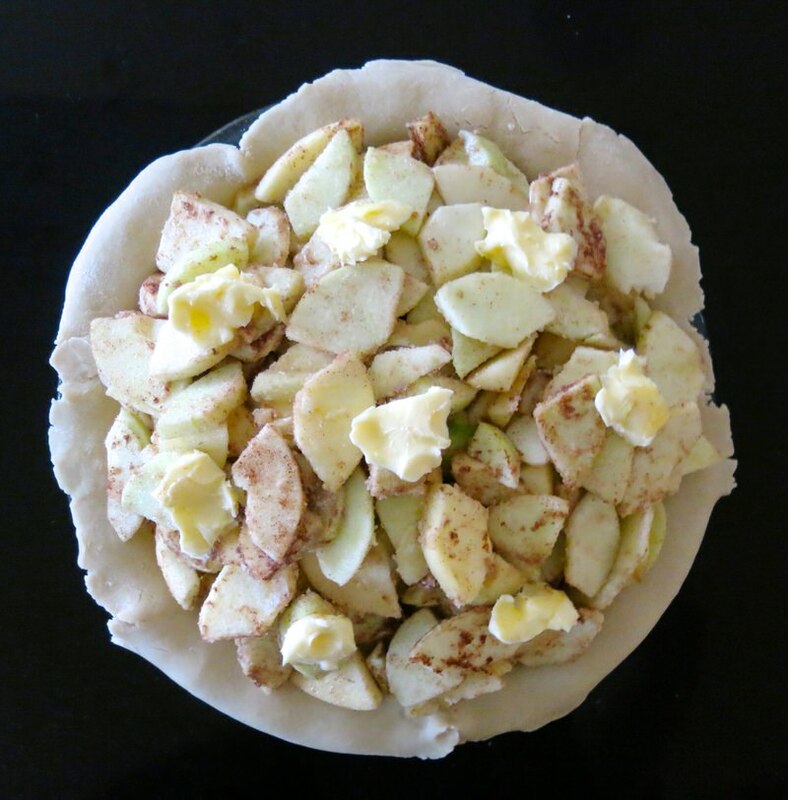 Use a very good tart apple that holds its shape when baked. 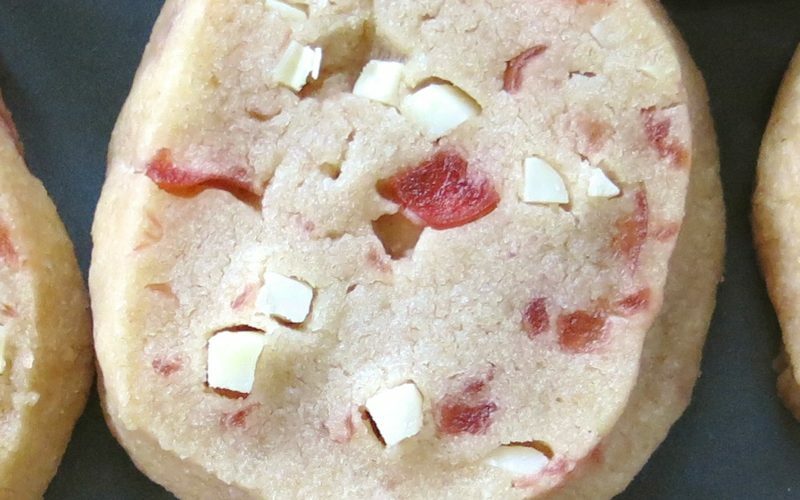 Use a very nice sweet apple that holds its shape when baked to balance the flavours. Use an apple that doesn’t hold its shape when baked to produce a lovely thick syrup. Of course, that would be the McIntosh for me. The others? In Alberta, the first would be the Granny Smith. Prior to this little lesson, that was the only apple I used. 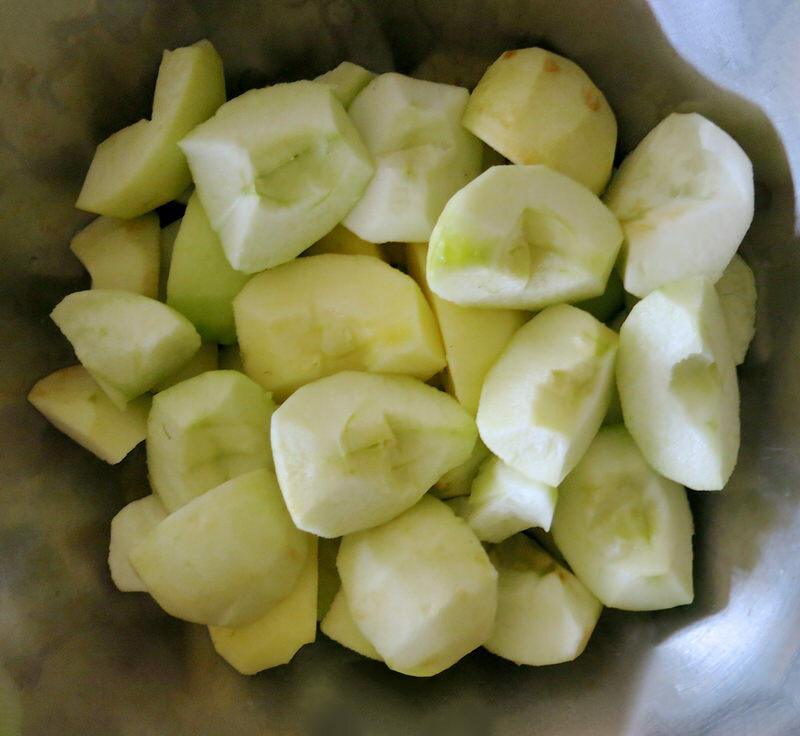 The second apple is usually a Gala or a similar kind of apple. Anna offered up different varieties that we don’t grow in Western Canada. 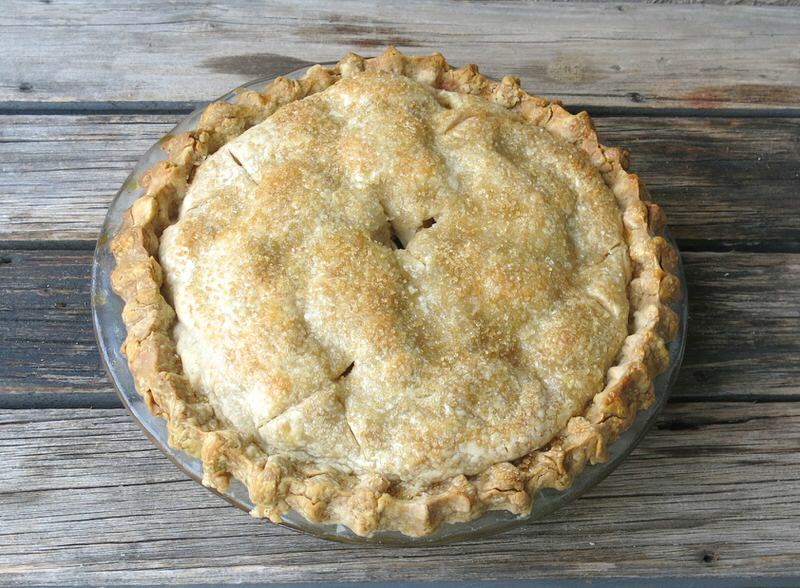 Mom taught me many things, but she never taught me how to make an apple pie. She refused. “I don’t want to waste the ingredients.” She’ll deny saying that, but she did. I am not sure if that was the main reason or the fact that she didn’t like how I cleaned up after myself in her kitchen the real reason. In any case, I taught myself how. Over the years, I have become a very good pie maker. The motivation through most of my life was to please my dad. 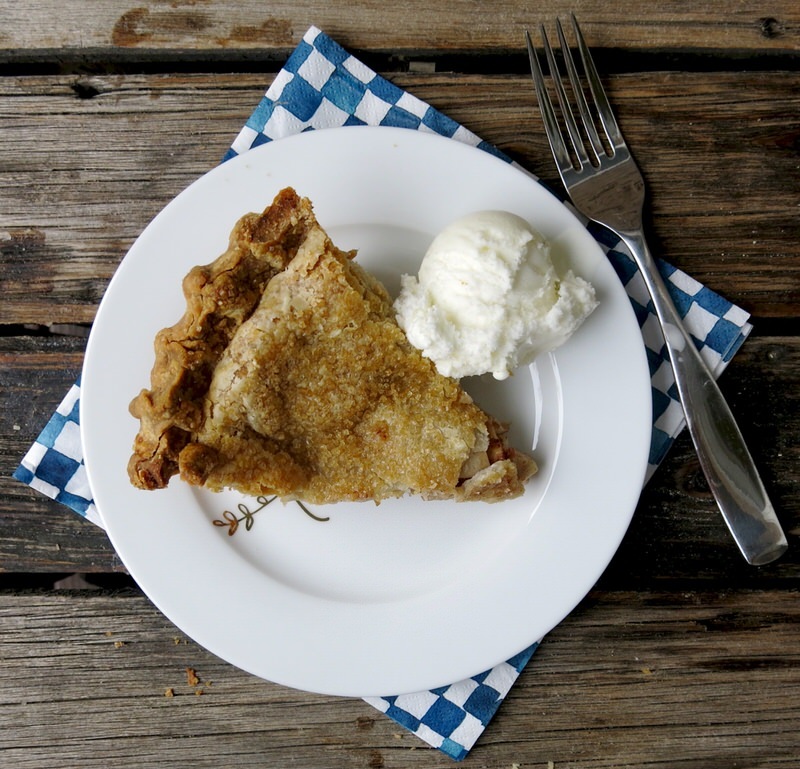 A Saskatoon Berry pie was his next favourite food on the planet. 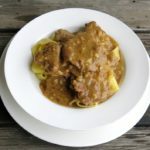 Now, it is to please my husband, remember my dad, and enjoy the recipe that was shared countless times on our small Red Deer family kitchen table. I try to keep discs of frozen pastry in my freezer. 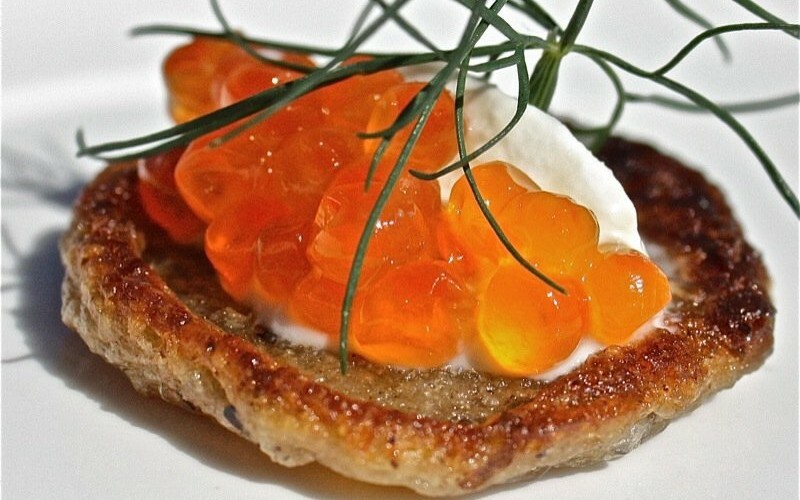 The recipe with step by step instructions for the pastry is here. 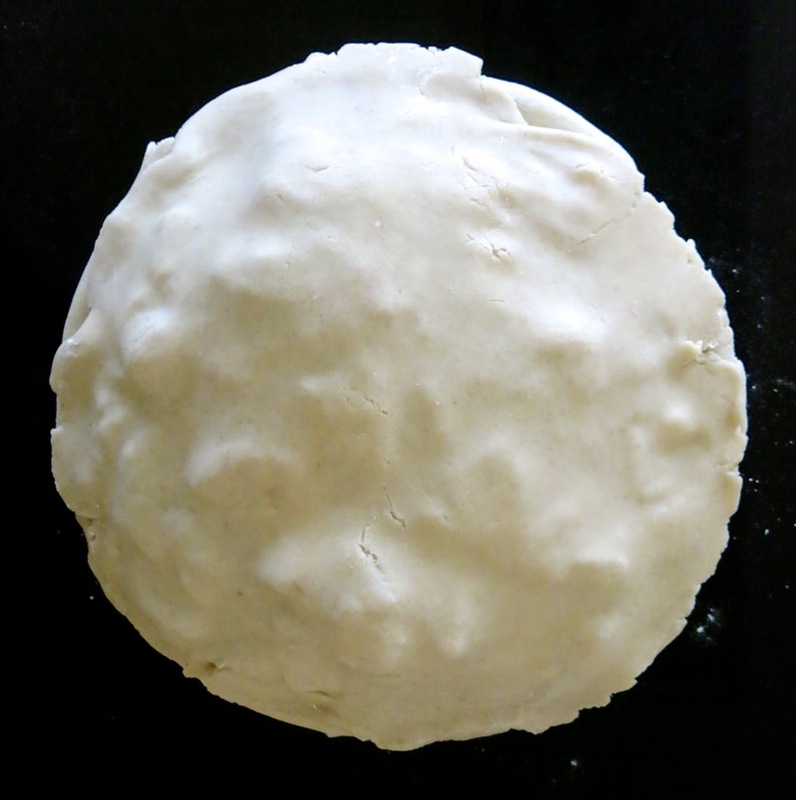 Bottom crust ready to be filled. Second disc will be rolled once ready to top the filled pie. 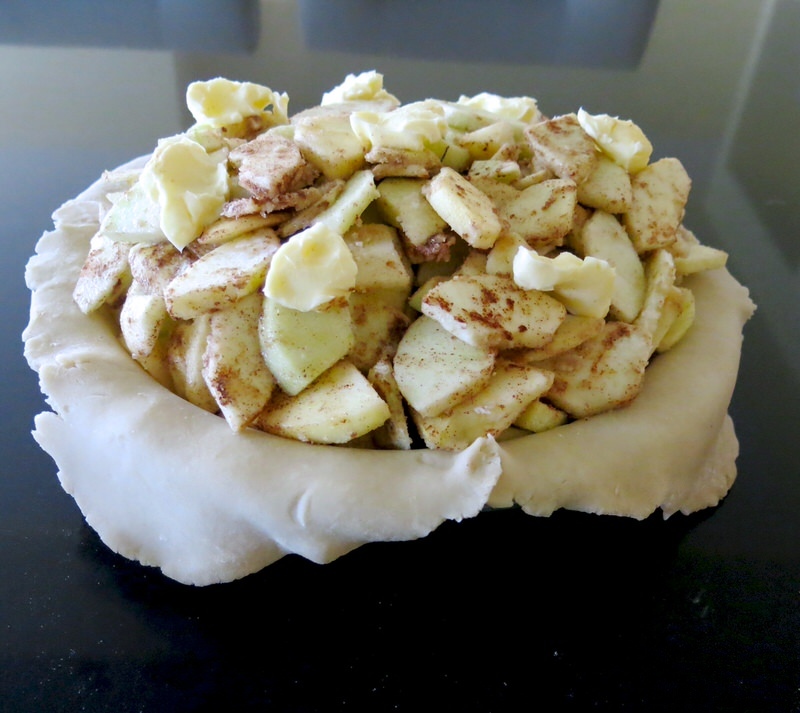 I fill the pastry with apples. I pile as many as I can possibly mound on top of the biggest pie plate I can lay my hands on. 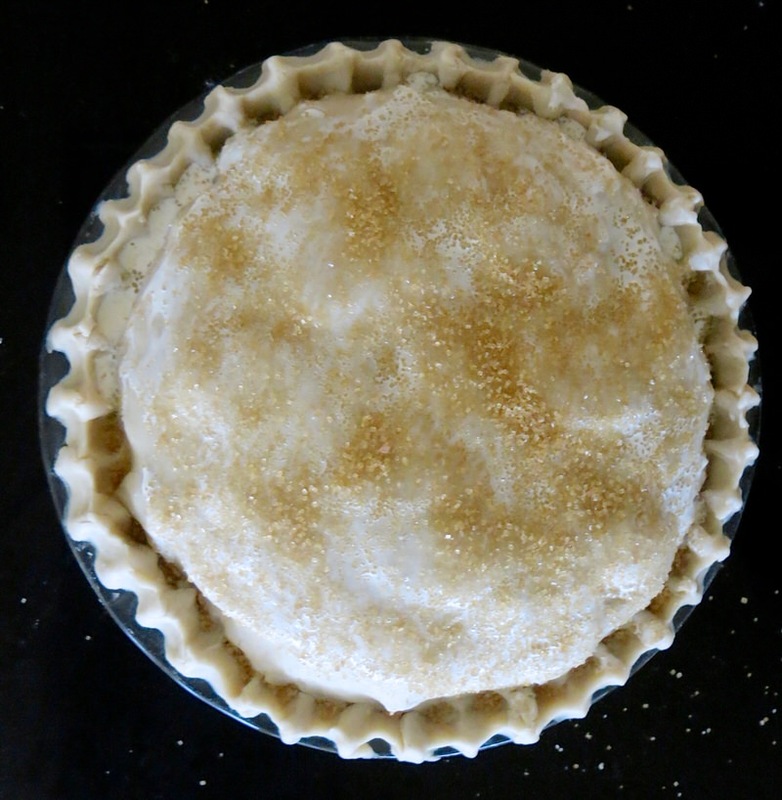 Cinnamon, sugar, then flour and butter just before the top pastry seals in the filling. 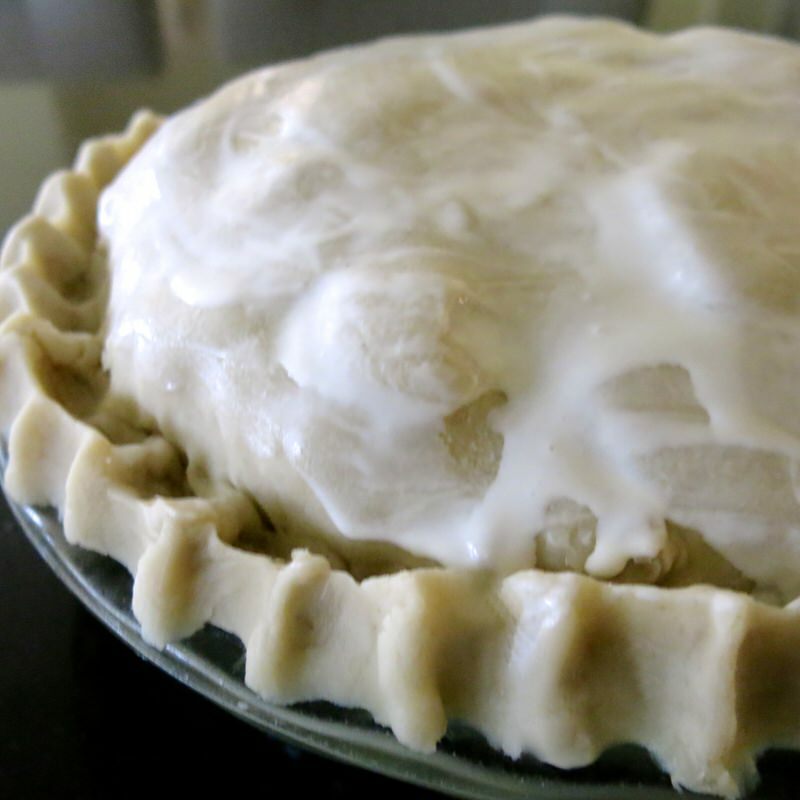 The butter adds that delicious fat to the sauce and the flour thickens the butter with the sugary apple juices to ensure the pie slices and isn’t soupy. Mom did teach me how to flute the edges. First pie I ever made, I was living in Lethbridge with my mom 6 hours away. No internet in those days. 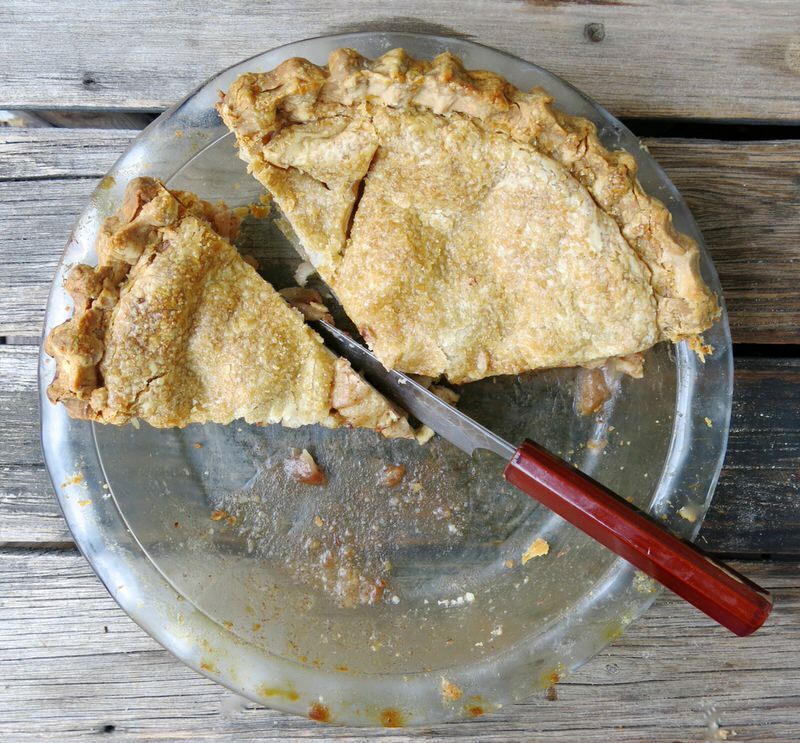 I used a fork to flute the edges of that pie. But that just was not going to do. 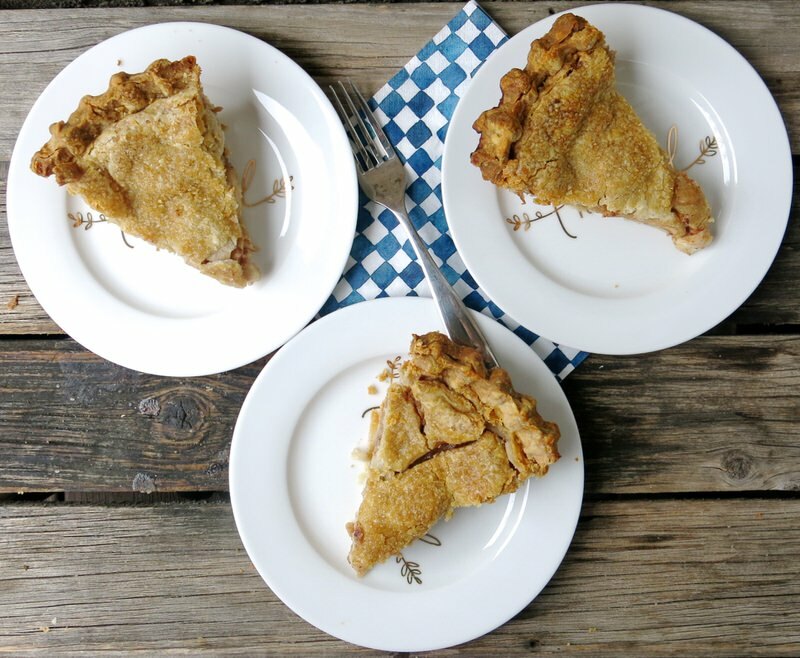 I recall a few times growing up that the church ladies would all make homemade apple pies for the yearly church lunch fundraising dinner. 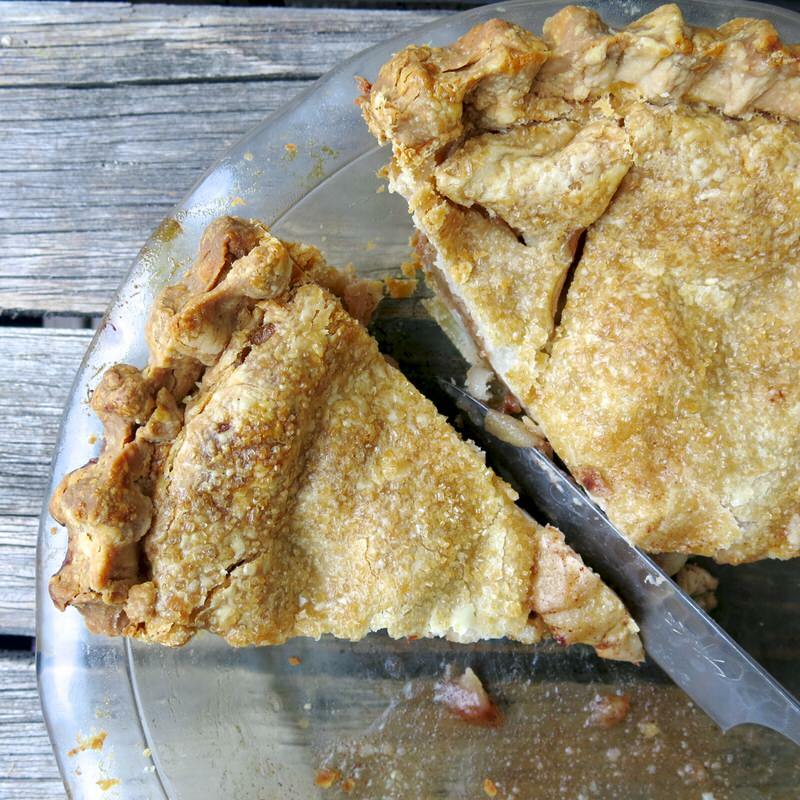 Everyone knew how to make a homemade apple pie. It was unheard of for one not to know how. Mom was as we all are about her baking. “Oh, look at some of these pies! They look anaemic! Who wants to eat a pie with a white crust? It should be golden brown.” or… “Look at how thick this crust is! And it is so soggy on the bottom. 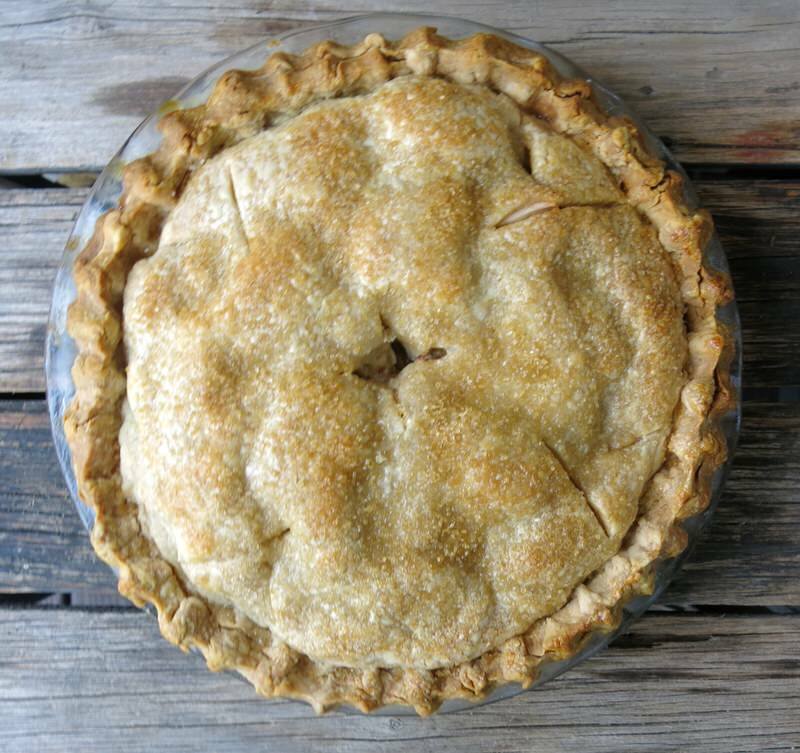 I would rather buy a pie to bring than bake one like this to bring to the church!” Oh, she might sound a little full of herself, but that’s not how I took it. 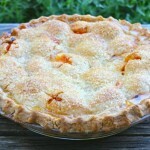 I learned pies needed to be golden and crusts thin, flakey and no soggy bottoms! And, mom was right. Everyone did bake pies in those days, but there were a lot of lousy bakers back then, too! One thing mom never did that I love to do and have been doing years before I ever saw anyone doing it: sugaring my crust. I just wanted a sugary golden crunch. 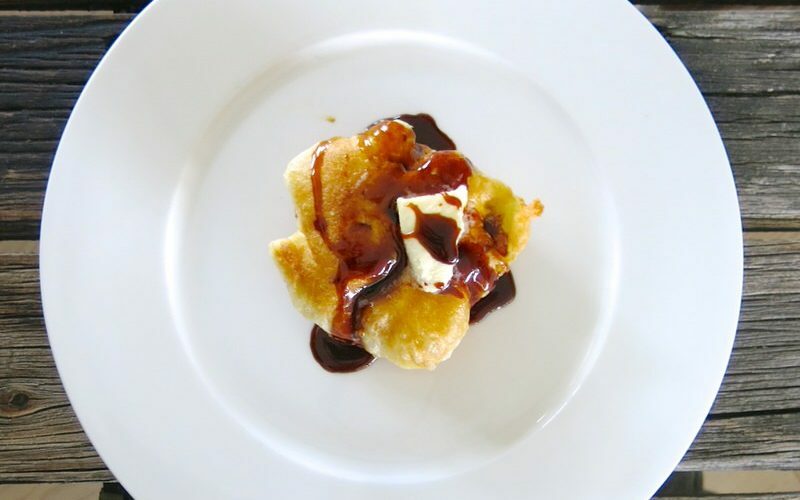 Heavy cream is brushed over the surface and then a generous portion of Demerara Sugar is sprinkled, or patted, on top. 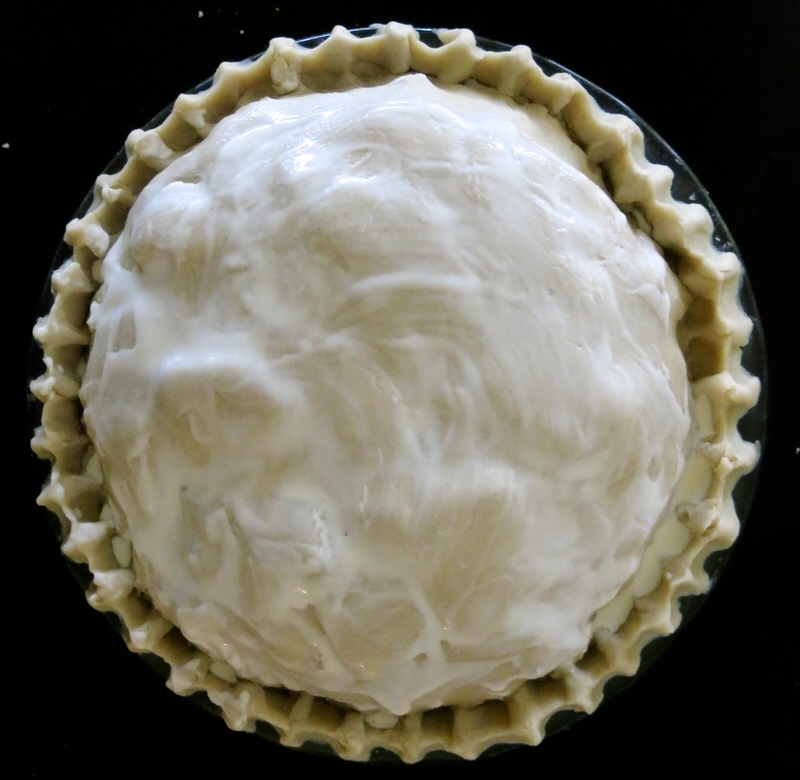 To prepare for fluting the edges, trim around the outside of the pie leaving enough overhang to fold under the edge of the pie. That makes the edge nice and thick. To flute the edges, use your pointer finger and thumb on both hands: your “pinchers”. 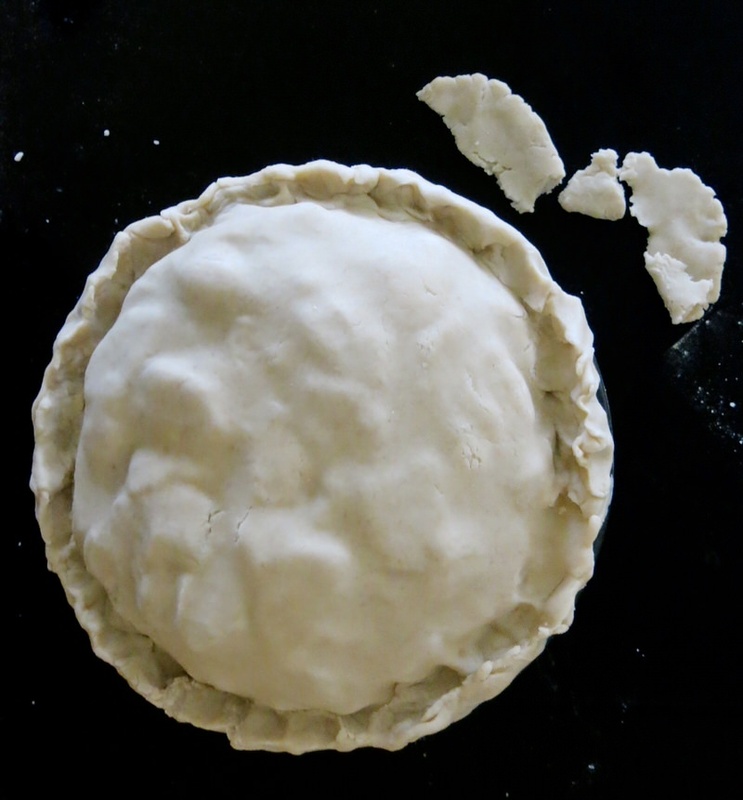 Align them side by side over the crust-to-be and pinch that thick pastry dough. There will be a ridge between each pincher. 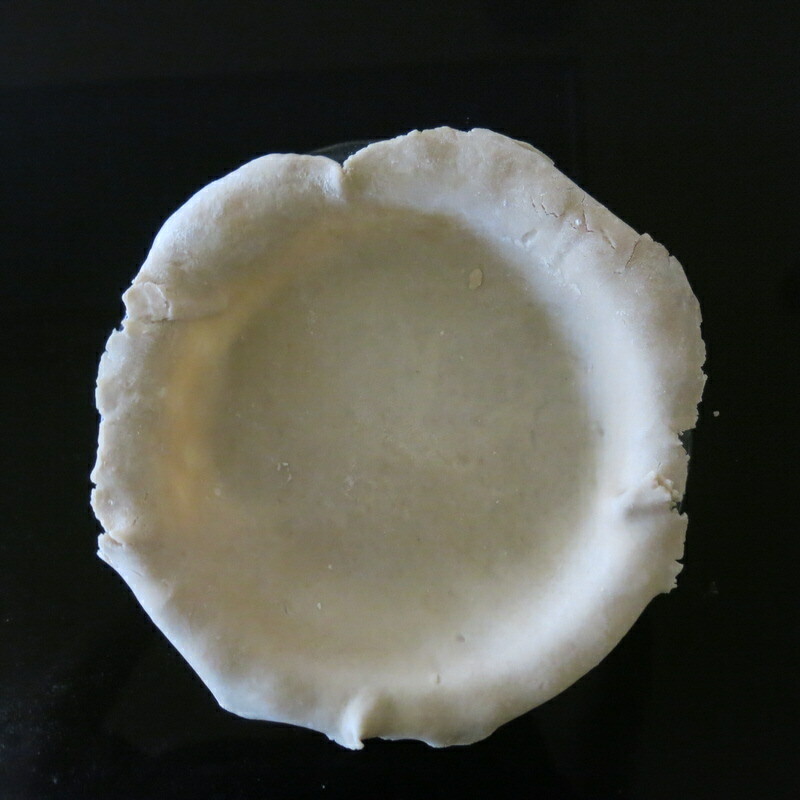 Move around the edge of the pie, placing the right pincher into the ridge left by the left pincher, and continue to pinch, or flute, the edges of the pie until you get back to where you started. I often go around one more time to tidy it all up. The fluting is never perfect which is part of its charm. 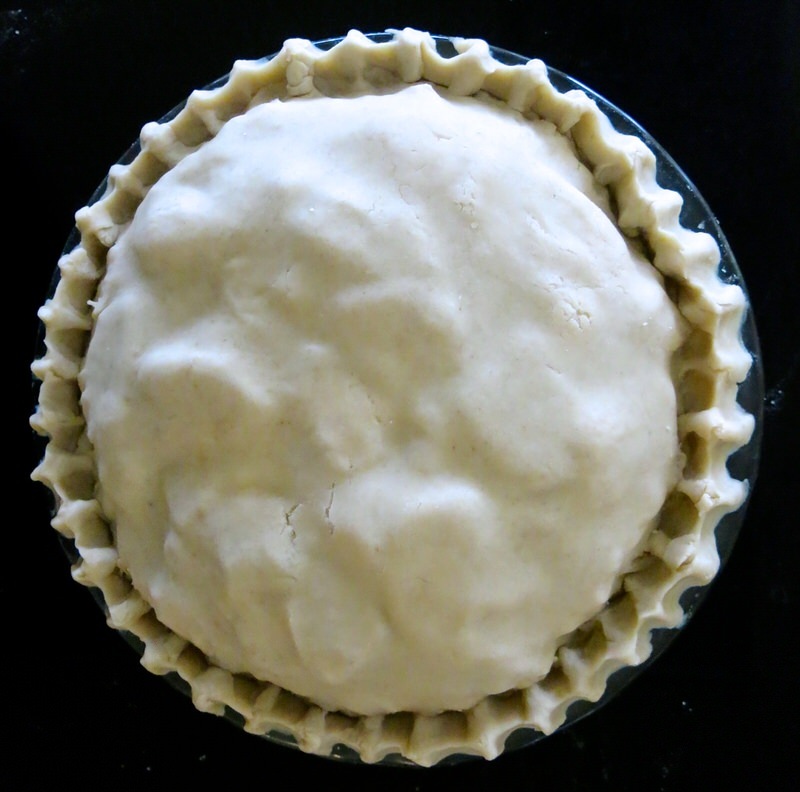 The pie is then vented and ready for the very hot pre-heated oven. Learn from my mistakes. Place a cookie sheet with foil on the bottom of your oven to catch the drippings when the pie boils over. The first 15-20 minutes at 425F and the remaining hour to hour and 15 at 375F. Usually, I place foil on top during the baking so the crust doesn’t get too brown. 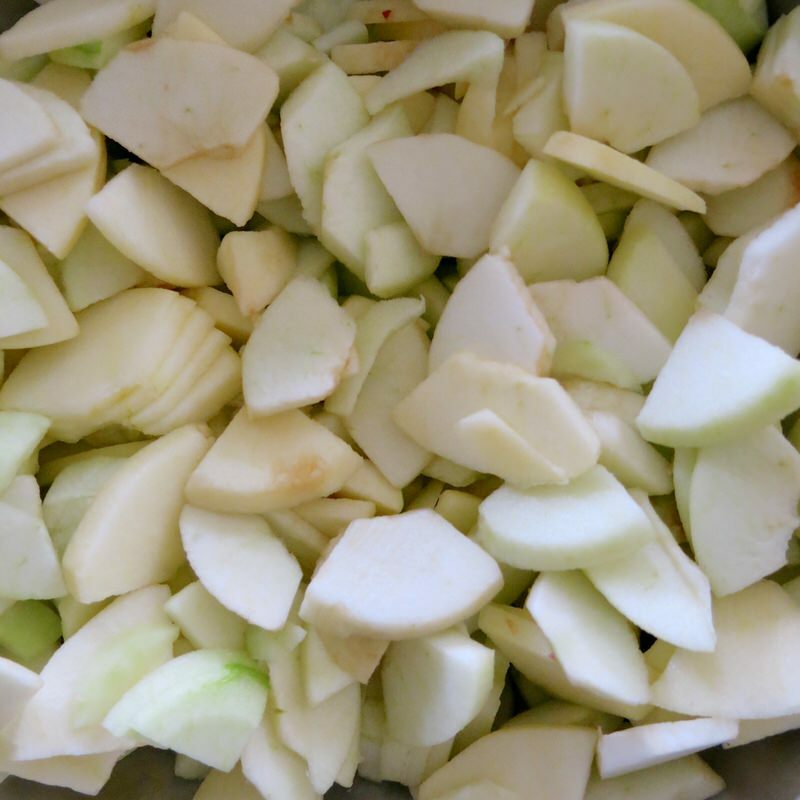 The filling needs plenty of time to bake as the apples must be completely cooked through and rather soft when sliced into. I think mom would be proud. I am sure she was. 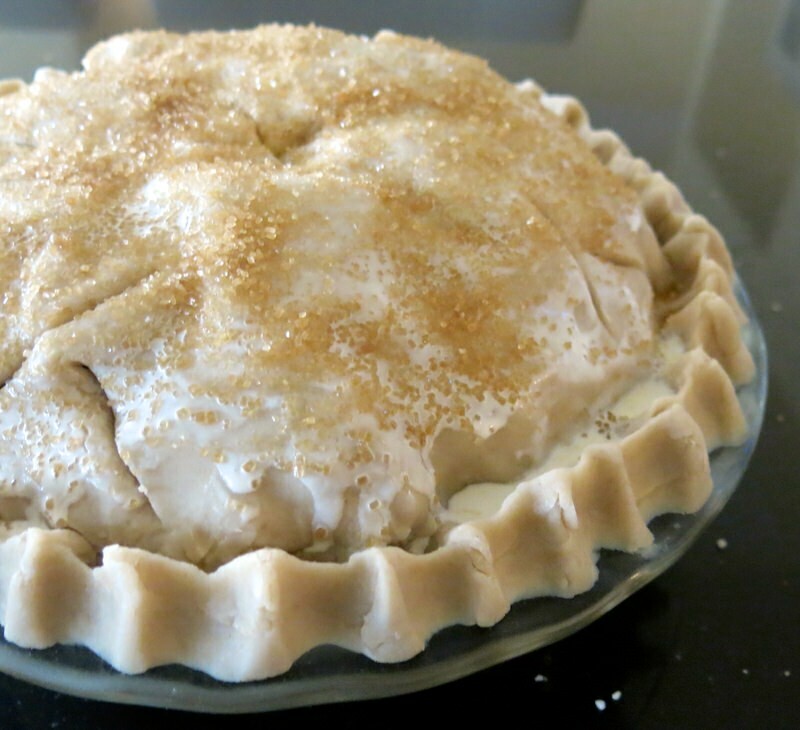 100% lard Tenderflake Pastry is mom’s favourite, yet I do half lard and half butter most of the time for my pastry. This is one Tasting that I need to do side by side. 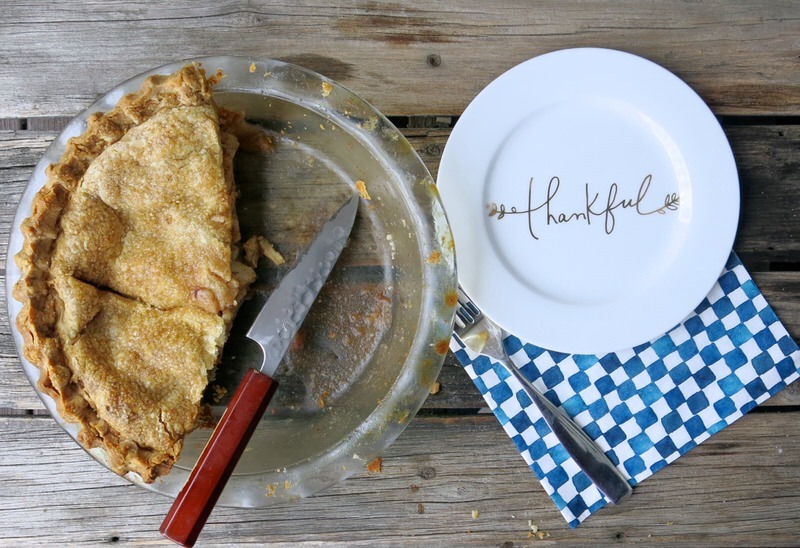 Success for me is not seeing a pool of sauce at the bottom of the pie plate. 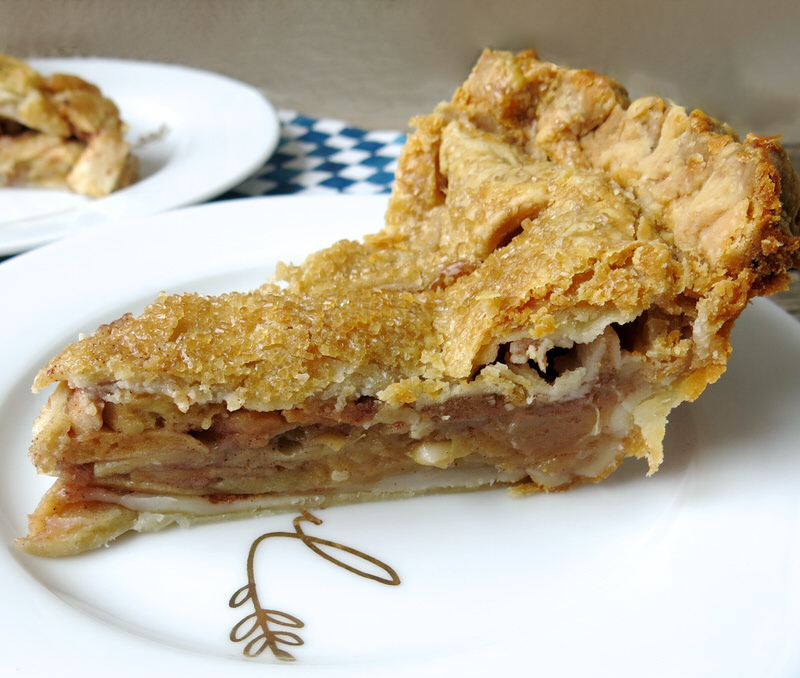 Look at this slice of homemade apple pie. It almost has an attitude and well it should. 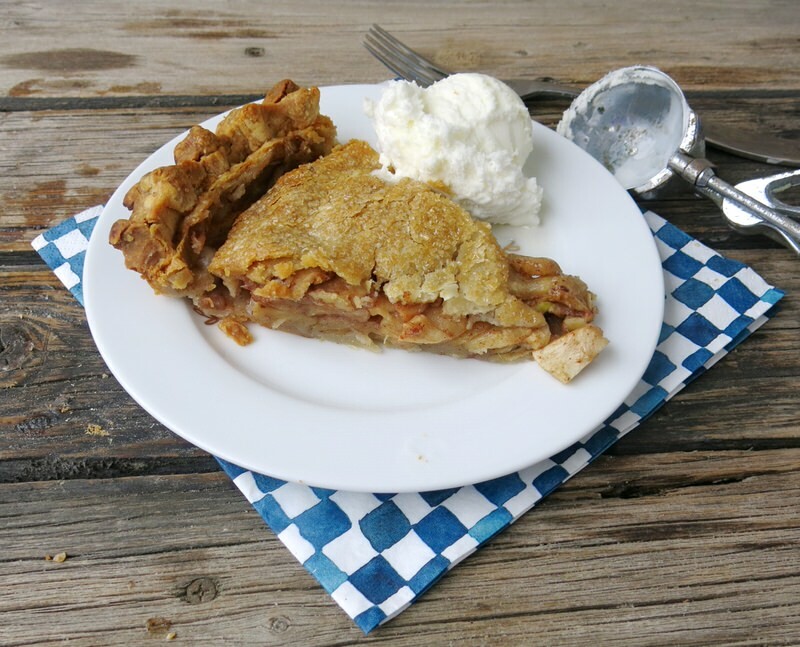 Tender, golden and flaky buttery pastry with layers of delicious apples and no soggy bottom! This was our dessert for Thanksgiving Dinner last fall. 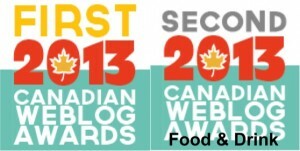 I took an unintended 6-month break from writing about food and my website last year. 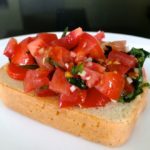 It is clear that I still love to cook and write and photograph my food, so I have a lot to catch up on. I write about our favourite family foods all of the time and have never written about apple pie. I think my next one will be served with cheese. Right, dad? Meanwhile, if you make it, tell me. 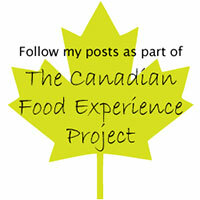 Or, if you have your own favourite apple pie recipe or pie recipe, share it. Or, better yet, share the pie story. I made apple crisp Friday. 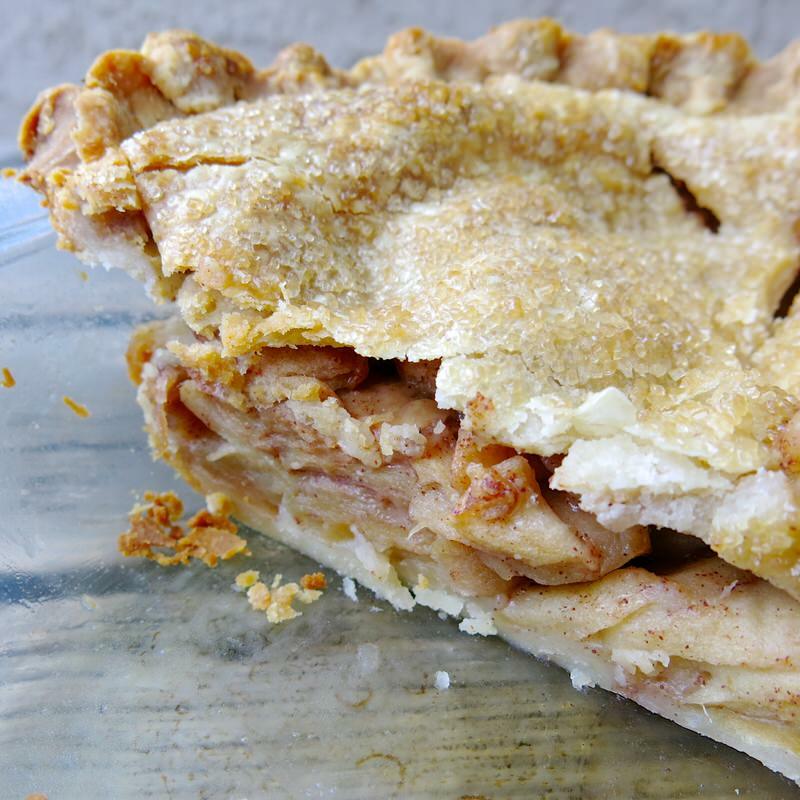 I have pastry in the freezer and I think it’s time for another apple pie. I know no one in my family would disagree! 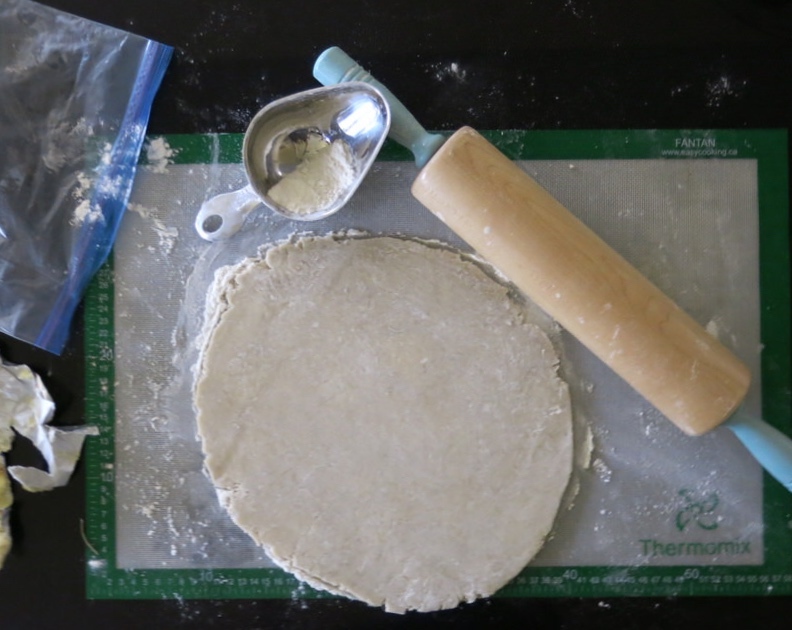 Instructions for making the pastry can be found in the link in the notes section. 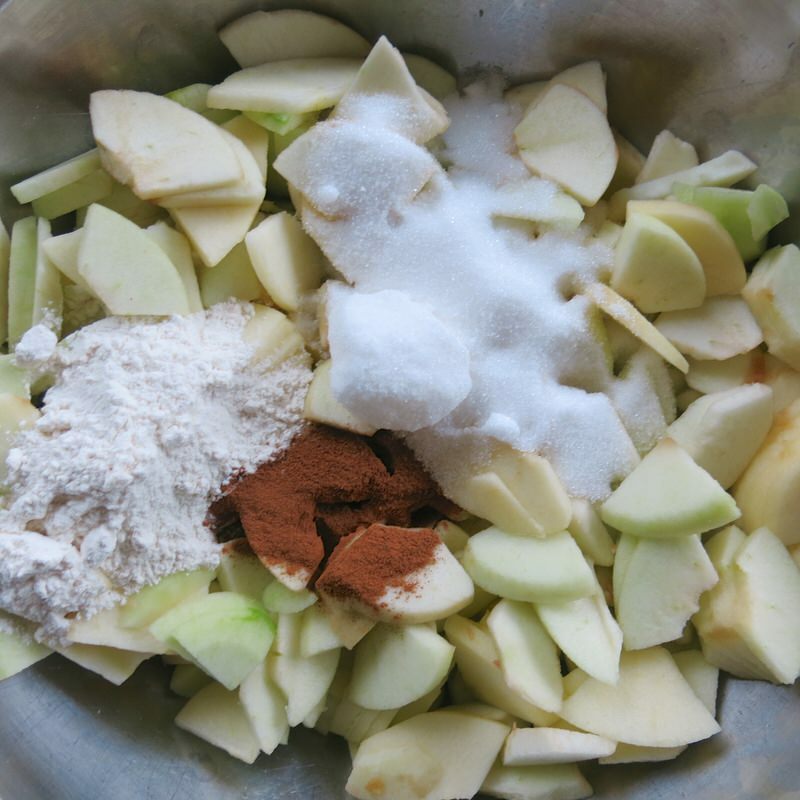 When making any apple dessert or pie, the brightest apple flavour is developed through using a variety of apples in flavour and in texture. 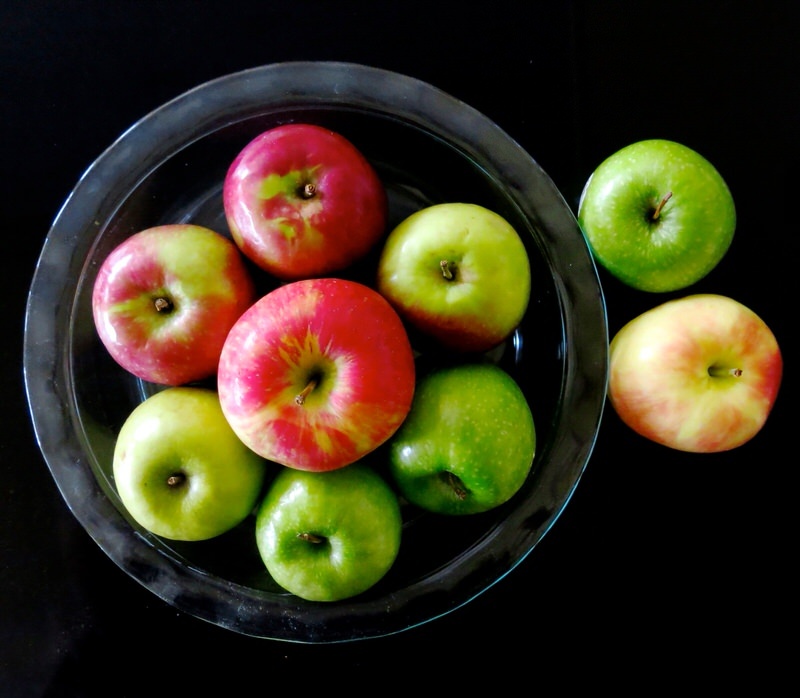 Three flavour types: very tart, very sweet, and very "appley" and two texture types: apples that hold their shape when baked and apples that turn mushy (as they create great flavour and act as filler for the juice). What do you mean you’ve never written about apple pie?! You’ve forgotten me already, and our pie baking session?! Your recipe looks delicious, and looks to have evolved a little since we last baked together. 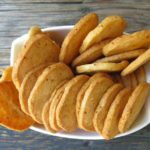 I’ve never written about how we make OUR TRADITIONAL FAMILY RECIPE! Of course, I have never forgotten about you, our pie making session and the great fun that I, for one, had that following year, with you! I always try to evolve – haha – but thought this was as it has always been. 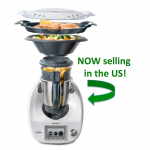 Your process was so vastly different and I loved it… and did it a few times, but keep going back to “mama’s way”!